Spring Blossoms by Lynn Quinn - 10" x 8"
Spring Blossoms poster by Lynn Quinn. Our posters are produced on acid-free papers using archival inks to guarantee that they last a lifetime without fading or loss of color. All posters include a 1" white border around the image to allow for future framing and matting, if desired. Thank you so much, Deepali, for your kind comments. 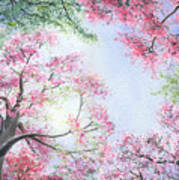 This was painted quite some time ago, but as I recall, I used pieces of natural sea sponge to paint the blossoms. 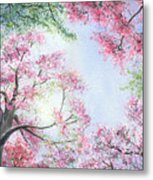 I started with the lighter shhades, then added darker pink for the contrast and to give some depth to the blossoms. Plus I had to get a bit of green in there, as well, for the leaves among the blossoms. Hope this helps. Dear Lynn, I have been trying to paint the Indian "May Flower" trees that have a similar anatomy when compared to your cherry trees. Our trees are a vermillion / crimson red and are striking in May....lining our dusty Indian roads and make for stunning photographs. The rains make them a much more beautiful sight when set against cloudy skies and dull earthy tones. However, my passion is to paint these beauties for my home. 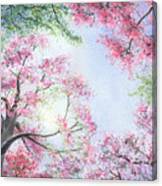 I have not been able to capture the look of the flowers and the overall magic the tree lends to our landscapes. 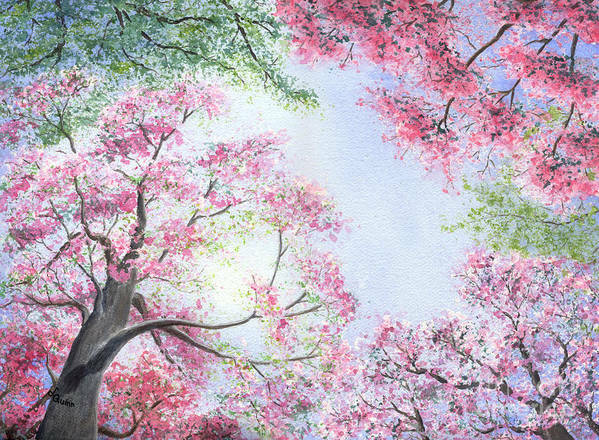 I am curious to know how you brought the lovely flowers of the cherry blossom to life without painting each petal. I look forward to your help and guidance in this regard. I absolutely love your painting for its life like, and fresh beauty. Thank you so much, Danuta! Thanks so much, Marlene! I thought your flowers were wild roses. They are always such a nice surprise to come across when out walking! Thank you so much, Eszra! I appreciate your kind comment! I've actually never found a location quite like this, with the trees close enough together -- this was pretty much from imagination and wishful thinking, painted on a cold winter day. Thank you so much, Ove! That's very much the feeling I was going for, when I painted it in a very cold, snowy January! Thank you very much, Anne-Elizabeth!